Paro, a therapeutic robot, reacts as it is patted during an exhibition in Tokyo in 2009. The seal-like robot is packed with about 100 sensors that enable it to respond to peoples’ body temperatures, touch and to light and sound. If you're approaching retirement and looking for help, you might want to ask your robot. Technology, including artificial intelligence (AI), is becoming an increasingly important part of that last frontier – old age. Smart tech is already being deployed to help with everything from financial decisions and management to keeping the thermostat steady. Now in some cases it's even being used for "softer" tasks, such as making sure you have someone – or something – to cuddle up with and talk to. 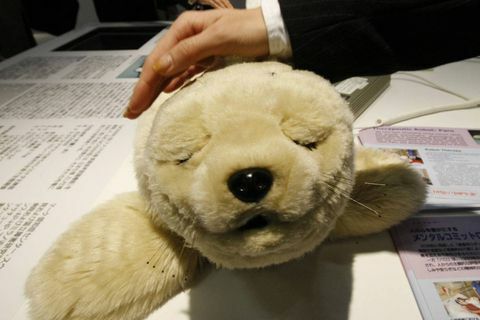 The latter trend got started in Japan, at least, where seniors' homes have been using "Paro" a sweet-faced seal-like stuffed creature packed with about 100 sensors that enable it to respond to peoples' body temperatures and touch, and to light and sound. Paro is designed to stimulate the brain by interacting with users when it is held, stroked or talked to. The Financial Times reports that about 5,000 Paros are now used in more than 30 countries, and early studies show the robo-seal to have a moderate to large positive influence on the quality of life for people who have dementia. Paros have actually been sold by their manufacturer, Japan's Intelligent System Co., since 2004; now, as AI advances, robots and robo-services aimed at seniors are picking up pace. Another Japanese robot named Palro is an R2-D2-like machine developed by Fujisoft. The 40-centimetre-tall Palro is designed to stimulate brain function by playing games and doing quizzes with its human companions. About 600 Palros are in use in Japan. Japan appears to be particularly advanced in its embrace of AI to interact with retirees because its population is aging rapidly. About 25 per cent of Japanese people are already more than 65 and the country's Ministry of Health, Labour and Welfare says that by 2025 there will be a shortage of about 380,000 caregivers. While Canada's population is not aging as quickly as Japan's, we're getting older, too. The most recent census found that for the first time, there are more Canadians older than 65 than under 14. That has implications for the way people embrace and rely on technology, says Nancy Peterson, CEO of HomeStars, an online service in Canada for finding contractors and home services. "It affects people's thinking about how they want to stay in their homes. Smart-home technology is getting more and more sophisticated and cheaper," Ms. Peterson says. When it comes to deploying AI, research suggests that North American seniors will rely on robo-help less for companionship or brain teasers and more for convenience and financial advice and management. In the United States at least, there seems to be resistance to surrendering all tasks to robots – a 2014 poll by the Pew Research Center there found that 65 per cent of respondents think using machines as primary caregivers would be "a change for the worse." "In Canada, the AI [services aimed toward seniors] offered is more in areas like fire prevention and remote-controlled door locks rather than caregiving and companionship technology," says Anthony Quinn, director of community affairs for CARP (formerly the Canadian Association of Retired Persons). Mr. Quinn says one of the big questions in the near future for AI and seniors in Canada is also which of the older generations will embrace a robo-assisted future. "For the first time in history we have two older generations. We have people who are 55-plus and we have their parents," he explains. Canadians in their 50s tend to be comfortable with using technology and may look more to AI-based services as they grow more pervasive and sophisticated. AI is already moving forward quickly in financial advice and management, and the use of financial technology, or fintech, seems to be growing among older Canadians. "Our average client is 47 years old and our second largest demographic group is baby boomers," says Randy Cass, CEO and founder of Nest Wealth, a Canadian financial robo-advisor that was founded in 2013. "There seems to be no hesitation among those who are considering retirement or who are already retired in accessing digital tools. It's as natural to them as it would be to a 30-year-old," he says. "When you combine the large data sets that artificial intelligence generates with the fact that people in their 50s and older have to make their savings last, you begin to understand the massive impact that AI will have on people planning and entering retirement." "There are many interesting possibilities," says Jonathon Narvey, content manager for WealthBar, a Vancouver-headquartered robo-advisor. "For retirement planning, the AI isn't necessarily cutting the financial advisor out of the process. What we're likely to see is AI helping the financial advisor to get faster and more comprehensive data analysis and provide more seamless client support," Mr. Narvey says. "These are both good things that will help deliver better service, and possibly even better returns."